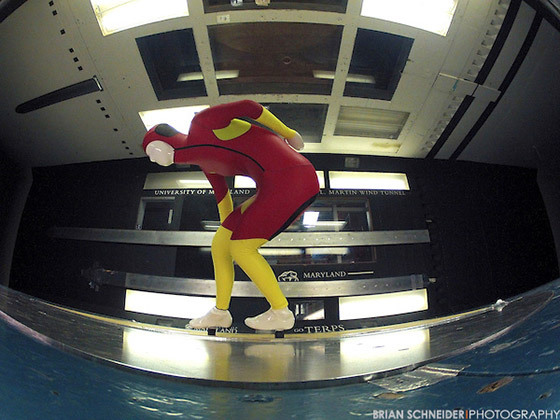 Wind Tunnel tests with custom designed mannequins and different Under Armour speed skating suit prototypes. In many sports that involve high-speed movements, drag or air resistance is probably one of their biggest enemies in achieving their peak performance. One winter sport that faces this challenge is speed skating, and turns out altitude plays a big part as well – the higher the skating venue is, the less air resistance there is (more about that in this article). Also, the effect of drag on the skater’s speed and performance is pretty significant and the suit that the skaters wear could have an impact on the colour of the medal they get. So just before the 2014 Sochi Winter Olympics, there was a bit of news about the revolutionary speed skating suit designed and made by Under Armour and Lockheed Martin. The “Mach 39” was supposed to be the fastest speedskating suit ever made. Unfortunately, instead of delivering medals (gold ones for that matter), the result was the US athletes performed below expectations. Now, this could be due to the suit OR if we break it down, could be due to a thousand other reasons (on top of the suit). a. With so many movements during speed skating, is it really possible to estimate the drag based on wind tunnel experiments? I mean, there are a number of sports that do drag tests in wind tunnels; like skiing and cycling. But these sports have moments of competing when the athlete maintains a certain position for a short period, and those are the moments where having an optimum position (aerodynamically) could really reduce drag significantly. But speed skaters hardly stay in one position during competition (maybe except at the starting line). Then if that’s the case, would the wind tunnel results be fully applicable on the track? b. Friction plays 2 roles: it slows you down and it gives you more grip/control. If there is too much friction, it impedes movement; but if there is minimal or close to no friction, the athlete might lose control. How then, do we strike a balance between them? c. Is it possible to measure drag dynamically on the track? Well, a company called Alphamantis seems to have done that, but with cycling, and in a velodrome fitted with gate sensors. Some additional input parameters they require include the bike’s wheel circumference and also inputs from standard power meters and speed/cadence sensors. With the power meters, there is a calibration process before the actual ‘aerotesting’ where they apply a model to calculate drag. For more details of the testing, you can read this interesting blogpost by DCrainmaker. I reckon it is possible (in theory) to develop a model for speedskating (similar to what Alphamantis did for cycling) to estimate drag on the ice skating track. The model might be slightly similar to this one in wheelchair racing: when the speedskater is pushing off (and at equilibrium), there are 4 different forces applied on the speedskater: 1) Reaction force, 2) Inertia, 3) Friction between the ice and skates, and 4) Drag force. Reaction force (or applied force) can be measured by instrumenting the skates with a shoe sole pressure sensor similar to this or this. Inertia can be determined by measuring the forward acceleration of the skater (using an inertia sensor or a suit of sensors), then multiplying that by the overall mass of the skater. Friction can be calculate based on the coefficient of friction of ice which is different for straights and curves according to this paper. Finally, since the sum of all these forces equals to zero, we can determine the drag force! Of course, this model is very much simplified and some assumptions are made, but if more thought is put into it, this might just work. Anyway, going back to the lacklustre results of the Under Armour Mach 39 suit, there could be so many reasons why the athletes didn’t perform during those races. Since US speedskating has extended the contract with UA, they obviously know that the suit wasn’t the main culprit. It did sound like the athletes weren’t really used to the new suit, so maybe at the end of the day, it’s just a matter of ‘breaking-in’ the suits. Thanks for reading and if you have any thoughts or suggestions on aerodynamics or drag tests, do leave some comments! We think testing speed skating suits using our bike-on-velodrome technique would be a great validation of the aero gains. Thanks for mentioning the DCRainmaker post about our services!